I love my Mexican food. Recently, I bought Thomasina Miers’ “Mexican Food Made Simple“, which turns out to be a fantastic collection of Mexican recipes from the former winner of Masterchef and founder of Wahaca. Over the last few weeks I’ve been trying out a fair few of the recipes form the book, and making my own adjustments for taste and availability of ingredients. This Butternut Squash and Chorizo Salad has turned out to be a firm favourite, and not something I would have tried had it not been for this book. Here’s my take on Thomasina’s recipe to serve two. Takes approximately 40 minutes. One small butternut squash (or half a medium one – even the smallest butternut squash can be too much for two). One finely chopped red chilli. Half a teaspoon of cumin seed – crushed. Half a teaspoon dried oregano. Half a red onion, roughly sliced. A punnet of baby tomatoes. I like a mix of red and yellow pomodorinos. A small bag of baby spinach. Cut your butternut squash into 5cm or so pieces, making sure you remove the skin and seed. I hate this job. I’m not a fan of how butternut squash smells when raw, but I love the taste after it’s been roasted, so I put up with it. If I’m feeling incredibly lazy I’ll buy pre-cut stuff from the supermarket. This does not make me a bad person. Put your butternut squash, chilli, cumin and oregano into a roasting tin, add enough olive oil to coat lightly and mix. Add the onion to the tin, mix, and cook for a further 10 minutes. Add the tomatoes, and cook for a final 10 minutes. Whilst the tomatoes are roasting, grind the coriander leaves into a paste in a pestle along with the salt and pepper. Add a tablespoon or so of olive oil, and mix. This will be your salad dressing. Slice your chorizo and sear it on a griddle. Once seared, place the slices on some kitchen towel to drain. Now that your vegetables have cooked, remove them from the oven and place in a large bowl. Add the coriander oil and gently mix. 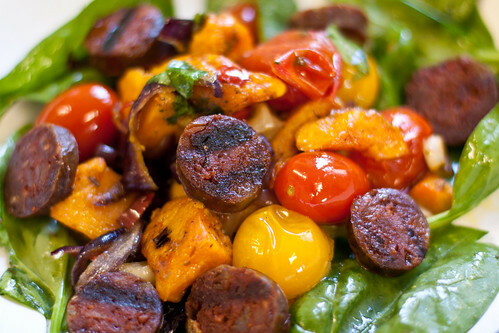 Finally, line a shallow bowl with spinach leaves, pile on your vegetables and top with chorizo. Tasty, and the chilli gives it a lovely kick. This sounds fantastic! I have some chorizo and I’m tempted to make this right now! Wow, this salad sounds excellent! Chorizo and butternut squash are a couple of my favorite ingredients. I’ll definitely have to try this out! This salad is absolutely delicious. We had bbq so could cook the chorizo on that and loved it. Thank you!